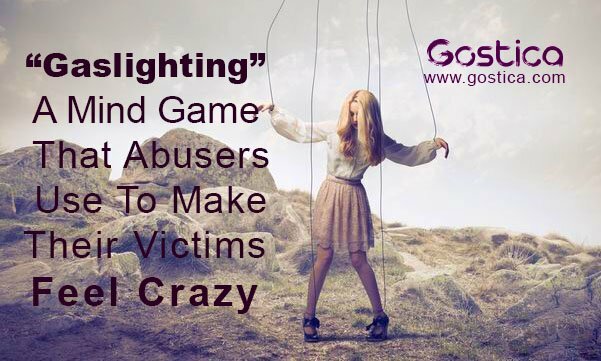 1Have you ever heard about gaslighting before? Have you ever felt like you were going insane? Well, it might be because someone was trying to make you feel that way. One of the most common ways abusers keep control of their victims is to have them discredited to the point that they question their own sanity, feel terrible about themselves, and also can’t figure out what the truth is and what isn’t anymore. This tactic is called gaslighting, and it’s named after a 1950s movie that focuses on a man who has managed to trick a woman into thinking she’s going crazy. It’s Often Done In One Of Several Ways. The most common way is to deny that something happened, despite you know for a fact that it happened. In Other Cases, They May Start Making You Wonder What’s Wrong Or Right. This is often done by citing religious textbooks, obscure philosophers, or even just pulling excuses out of their rear ends. Abusers Can Be Slick About It, Too. They often start off their gaslighting very slowly. More often than not, it starts with slight, subtle boundary pushing. For The Gaslighter, It’s About Winning Control At All Costs. And it’s about exerting pain. What you feel doesn’t matter to them. It’s about getting an ego boost or an emotional high from hurting, controlling, and manipulating you. This is why it’s a favorite tool of narcissists, sociopaths, and people who have an antisocial disorder. If This Sounds Like You, You Need To Leave Your Relationship. Just trust us on this. Domestic violence experts say that the best way to deal with gaslighting is to disentangle yourself as soon as you notice someone doing this to you. Do not engage with the gaslighter. Do not argue with them. Alert friends and family of what they’re doing, too. If possible, ghost on them and make sure the breakup hits them as a surprise. Above all, do not go back to him. He will only escalate the abuse if you do.